Points Needed: 262050 Software is not compatible with mobile and tablet devices. Please add this title to your Wish List and sign on to your the first club account from a desktop computer to complete your redemption. ABOUT THE SOFTWARE Available Languages: English Russian English German English Spanish English Portuguese English French English Italian	PROMT Expert 11 is a solution with advanced features for professional translators. With PROMT Expert 11 you can quickly obtain high-quality translations of any type of documents using full set of professional customization tools. Solution Scope… Translation of large information volumes for internal and external customers.Translation of standard documents (contracts, project documentation, technical specifications, manuals, etc. ).Corporate document management support, including documents in foreign languages.Integration of translation memories of different vendors and parallel texts.Fast extraction of text terminology, the terminology is stored in domain-specific dictionaries and kept up-to-date. TARGET USERS Language service providers Translation departments of companies Protocol services of companies Freelance translators	PROMT Expert 11 translates between the following languages: English - Russian and Russian - English English - German and German - English English - Spanish and Spanish - English English - Portuguese and Portuguese- English English - French and French - English English - Italian and Italian - EnglishBenefitsHigh Level of Translation Quality Improved translation algorithms, updated dictionaries and unique PROMT translation technology, provide the best quality of machine translation from and into English.Convenience Try a new PROMT Agent plug-in! Simply select a word or a text fragment in any program or on any web site, click a hotkey, and the resulting translation will appear in a popup window.Confidentiality To translate, you don't need an Internet connection. Your personal data and any translated information will not be disclosed to the third parties.Save of Time and Recourses	Letters, scientific articles, legal agreements, tables, presentations – all the documents you need for work, you can read in the native language or instantly translate for your friends and partners. 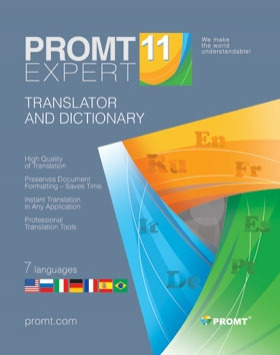 Modern PROMT technologies and up-to-date dictionary bases guarantee a high quality of translation. KEY FEATURES	Convenient Operation with Dictionaries and Glossaries Possibility of using PROMT domain-specific dictionaries and creating user's own dictionaries Manual and automatic dictionary creation Import of glossaries in manual and automatic mode Use of complex grammar information to enhance the machine translation quality and reduce post-editing efforts Comparing of dictionaries based on various criteria for different projects Dictionary editing Searching and sorting in dictionary Dictionary content printing in the Excel/Doc/Txt/XML document format Operation with Translation Memories Creation and integration of dictionaries and translation memories of any vendors Import of parallel texts into translation memories and TM conversion into the TMX format Quick filling of translation memories of different vendors (SDL Trados, DejaVu, WordFast, etc.) Support of current linguistic data exchange standards (TMX Level 1, TMX Level 2, TBX, TMW, XLIFF, OLIF) Information and knowledge accumulation helps deal with regular customers, guarantees quality and gradually increases the speed of operations, facilitates involving of new-comers into the process Compliance with the Approved Terminology and Document Style Terminology used in the customer company is the highest priority in the dictionaries. The system ensures that all translators within the project use the uniform terminology approved by the customer, thus speeding up the translation and post-editing processes Translation settings provide compliance with general stylistic rules adopted in the company or for the project You can use PROMT domain-specific dictionaries and/or create your own user dictionariesFunctionalityTranslation of Separate words, sentences, whole documents of many formats: pdf, doc, docx, rtf, xls, xlsx, ppt, pptx, xml, msg, and html Documents in batch mode Documents in Microsoft Office XP-2013 applications (Word, Excel, PowerPoint) E-mail messages in Microsoft Outlook XP-2013 Web pages Operations with Dictionaries Creation of user's own dictionaries Merging and comparing of dictionaries Use of PROMT domain-specific dictionariesOperations with Terminology Automatic terminology extraction and handling Toolkit for operations with terminological candidates Other Applications PROMT for TM and TM converter are dedicated applications for creation, import and setup of third-party translation memories Estimation of post-editing effort in the QA Lab (Quality Assurance Lab) applicationPROMT System CustomizationPROMT linguists and lexicographers can help you customize the system to achieve the best translation quality. PROMT also provides corporate trainings. Available services for translation quality improvement are: Development of glossaries and dictionaries for accurate terminology translation Filling of translation memories with previously made translations PROMT machine translation training and customization (including dictionaries, TMs, etc.) based on customer's data Webinars and trainingsWHAT'S NEW	New in PROMT 11Improved translation algorithms, updated dictionaries and a unique PROMT translation technology provide the best automatic translation from and into Russian.Use a unique PROMT Agent plug-in to translate highlighted text in any Windows application.To install PROMT Agent: Launch the PROMT main application. Click the PROMT Agent icon. Follow the instruction on the screen.Updated functions of automatic identification of document's topic and type.SYSTEM REQUIREMENTS	500 MHz Pentium processor or better	At least 64 MB of RAM SVGA or better video card and monitor	Operating system: Microsoft Windows 10 Microsoft Windows 8 Microsoft Windows 7 Microsoft Windows Vista Microsoft Windows XP Professional with Service Pack 2 or higher NET Framework 3.0 (installed automatically)Plug-ins with translation capabilities are supported for the following third-party applications: Microsoft Office XP-2013 (only 32-bit versions) OpenOffice.org Writer v2-3.2 Microsoft Internet Explorer v8-11 Mozilla Firefox v24	© PROMT, 2003 - 2016 . All rights reserved.